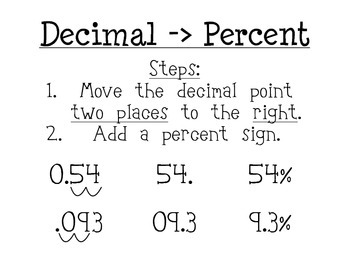 Convert Percentage to Decimal Divide the percentage added to the original by 100. For example, if a sales tax of 6 percent was added to the bill to make it $212, work out 6 ÷ 100 = 0.06. Multiply the result with a numeric constant: 100.0 (with decimal point!) to implicitly cast the bigint result of count() to numeric. You can use an explicit cast as well. round() is optional.